You add virtual COM ports using the COM/IP Control Panel. Each virtual COM port has its own software modem. 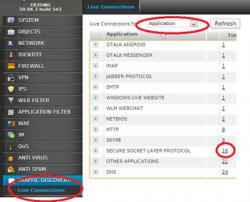 Your application uses COM/IP virtual COM ports instead of local physical COM ports. If your application uses Windows modem devices, you can create them on virtual COM ports using the COM/IP modem driver. Your application "dials" and reads/writes data using COM/IP virtual COM ports instead of physical COM ports. The software modem processes AT modem commands, including dial commands like ATDT19207413700504000, which specifies IP address 192.74.137.5 port 4000. The COM/IP Redirector automatically makes a TCP/IP connection to the location indicated in the ATDT command, then begins relaying the virtual COM port data stream. The field unit accepts the TCP/IP connection from the COM/IP redirector and the application gets a CONNECT. The field unit can also initiate TCP/IP connections to the client computer, which appear to your application as RING events on the COM/IP software modem. SSL/TLS encryption can be used to protect the data stream, relying on optional COM/IP support for encryption and certificate presentation/validation.